This is a crazy collection of 44 wacky and wonderful works. It presents rhymes from many of the world's most famous writers, such as Lewis Carroll, Edward Lear, Alexander Pope...and of course the prolific Anonymous! 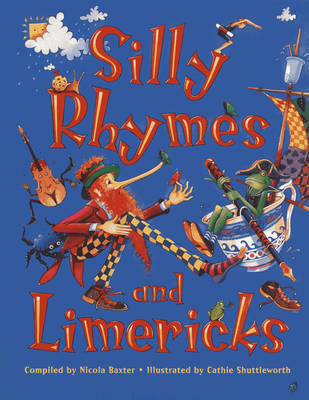 Divided into thematic sections, including Animal Antics, Peculiar People, Nearly Nonsense and Silly Stories, it includes everything from lengthy poems such as "Little Birds", "The Walrus" and the "Carpenter", and "The White Knight's Song", to a multitude of single-verse limericks. Bright, lively illustrations by Cathie Shuttleworth bring all the characters to life in intricate detail - and watch out for a busy bee buzzing around on every page. It is a beautifully presented anthology that the whole family can enjoy. When your woggles are all of a winkle, And your bruggles are chingle and spleed, What you need is a look in a honglemous book Like this one - it's just what you need! There is nonsense that almost means something. There are antics and oddness in rhyme. You will giggle your klurkiest grungles away, And have a pomjinglemous time! And if you are funglous at every stage, There's a bee to be found on each yopplesome page!